IVL – the Swedish Environmental Research Institute Ltd. is Sweden’s leading organisation for applied environmental research. It is a non-profit independent research institute, with more than 30 years of experience of co-operation with industry and government. IVL’s activities consist of scientific research, consulting and education services at both national and international level. Its international experience is extensive, including contracts performed in Europe, Asia, Africa and South America. International research and consulting assignments have been undertaken for the European Commission, UNEP, IBDR and the Swedish International Development Cooperation Agency, Sida, among others. Along with the Stockholm Environment Institute (SEI), IVL works in the Swedish International Development Co-operation Agency (Sida) Programme on ”Regional Air Pollution in Developing Countries” (RAPIDC) in Asia and Africa since 2000 to support air pollution monitoring and policy recommendations. Full information about the RAPIDC programme. As part of this programme, IVL is collaborating with the Environment Protection Training and Research Institute (EPTRI) in Hyderabad, India. EPTRI conducts air quality monitoring using passive samplers. The activities include Emission inventory of point sources, traffic volume counts and mapping the data sets on GIS platform. EPTRI is an independent registered society by the Government of Andhra Pradesh with assistance from the Government of India. The State has also provided bilateral assistance for technical collaboration between EPTRI and Sida. In October 2005, the researcher Karin Sjöberg from IVL participated in the Second Regional Stakeholder meeting of the Malé Declaration in Delhi. The Malé Declaration on Control and Prevention of Air Pollution and its Likely Transboundary Effects for South Asia is an inter-governmental agreement to tackle regional air pollution problems, established in 1998 by the South Asian countries at a meeting of the SACEP Governing Council. It is the only environmental agreement covering all the countries of South Asia. Participating countries are Bangladesh, Bhutan, India, Iran, Maldives, Nepal, Pakistan and Sri Lanka. The project was a part of the 2001-2004 phase of the Sida-funded RAPIDC programme (being co-ordinated by the Stockholm Environment Institute, SEI). Jonas Röttorp is an expert on water pollution monitoring and treatment of municipal and industrial wastewaters. He has worked on the European Union funded project “Liaoning Integrated Environmental Program (LIEP)”, as well as instrumentation and monitoring of water pollutants in river basin systems, industrial and municipal wastewaters. In December 2006, he was part of a IVL team that visited Bangalore and Hyderabad in India, participating in a multistakeholder dialogue, in both cities organised by the Society for Voluntary Action Revitalization and Justice (SVARAJ) and co-hosted by CII, APPCB and Andhra Pradesh Bulk Drug Manufacturing Association. IVL has established collaboration with SVARAJ, an organisation focusing on providing and working towards sustainable solutions for natural resource management. The aims are reached through an integrated approach on economic prosperity, social justice, environmental sustainability and cultural values; challenging a growth paradigm that increases inequalities, insecurities and environmental degradation. SVARAJ is led by Ms. Bharti Patel, formerly Director of a high profile, well-respected and successful campaigning charity in UK, with a track record of influencing policy and working with marginalized communities. Her achievements in the UK include successfully lobbying for Britain’s first ever-national minimum wage through consistent presentation of rights based policy. In India she is currently working in programmes seeking practical solutions in Water Resource Management to ensure Food Security, Livelihood and environment Protection for community cohesion, poverty reduction and addressing growing inequality. During the 2007 Stockholm World Water Week, SVARAJ organised a roundtable discussion to discuss the challenges for pollution mitigation and management in India, specifically for small and medium industries. The discussion, held on 12 August 2007, brought together a diverse set of resource experts as well as participants at the World Water Week, and highlighted the need for technology options for effective management of industrial pollution. In May 2008, Ms. Patel participated in the Globe Forum 2008 conference held in Stockholm, and more specifically in a workshop focusing on ”The rise of microfinance: How village women challenge Wall Street men”, along with Mr. Dipal Chandra Barua from Grameen Shakti (the Nobel Prize Laureate microcredit institution in Bangladesh). More information. Since 2009, IVL is involved in a successful implementation of a partnership cooperation programme with India, funded by the Swedish International Development Cooperation Agency, Sida, through its Programme for Partner Driven Cooperation (Aktörssamverkan). The project leader at IVL is Dr. Jonas Röttorp. Sida’s initiative for Partner Driven Cooperation is aiming to support sustainable cooperation relationships, based on the partners own initiatives and mutual interest in cooperating. Partners may be authorities, municipalities, non-governmental organisations, institutes, trade unions or private companies. The goal is to establish long-term, self-sustaining relations, and to create a ”win-win-win” situation for the people in poverty, for those participating in projects in partner countries, and for those involved in Sweden. This initiative concerns only countries in “Category 5 – Selective Cooperation Countries” – China, India, Indonesia, Vietnam, South Africa, Botswana and Namibia. More information about the programme. IVL’s main collaboration partner on the Indian side is the Jawaharlal Nehru Technological University (JNTU) in Hyderabad. Several other partners in India are however also participating in the collaboration, including CII, the Indian equivalent of the Confederation of Swedish Enterprise; the environmental institute EPTRI; and Gamana, a voluntary organisation promoting environmental debate in society. The project focuses on the fact that industrial companies in Hyderabad need knowledge and technology to purify waste water. The collaboration with IVL makes it possible for them to enhance their expertise and consider holistic solutions for polluted water. More information about the Hyderabad project, in an article on Sida’s web site. 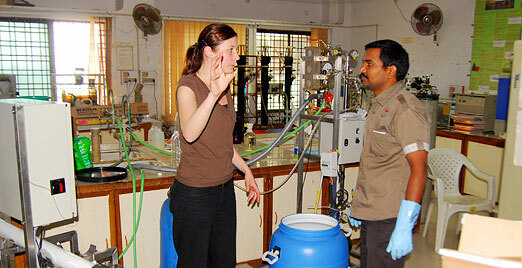 The Swedish Environmental Research Institute is also involved in the effort to create INSTEC – a national network centre for Indian-Swedish Cooperation on Technical Research and Education. This is a major project jointly run by IVL and eight Swedish universities (Blekinge Institute of Technology in Ronneby/Karlskrona; Chalmers University of Technology in Göteborg; Royal Institute of Technology (KTH) in Stockholm; Linköping University; Luleå University of Technology; Lund University, Swedish University of Agricultural Sciences (SLU) in Uppsala; and Uppsala University). INSTEC is administratively affiliated to one of the partner universities – KTH – but it will constitute a national entity. More information about INSTEC. In April 2008, INSTEC organised a Mobile Workshop at three different locations in India, in Hyderabad – Pune – New Delhi, as part of a tour in India for Swedish university representatives, including people from IVL. Read the INSTEC report.